The roots of Chinese astrology go back thousands of years. Needless to say in the course of millennia a number of different systems have been used. There are two main types, those that rely on birth data alone, and those that use birth data but rely primarily on positioning of stars and planets. Most use the lunar calendar (see appendix 1 for more info on the Chinese calendar) which bases its calculations on the cycles of the moon. That is why Chinese New Year falls on a different date every year. Some Chinese systems use the solar year as Western astrology does. Both, however, make use of Chinese five element theory. The five elements are Wood, Fire, Earth, Metal, and Water, always being given in that order. It is said to be a productive cycle, that is Wood produces Fire; Fire produces Earth; Earth produces Metal, Metal produces Water, and Water produces Wood, thus continuing the cycle. The balance of these elements and their positioning in a Chinese chart enable the astrologer to tell many things about a person’s personality and life. As with Western astrology, Chinese astrology has 12 primary signs, Rat, Ox, Tiger, Rabbit, Dragon, Snake, Horse, Sheep, Monkey, Rooster, Dog and Pig. There are variations in the names. Some people, for example, use Buffalo for Ox or Boar for Pig. It’s interesting to think about why Chinese astrologers have used these particular animal names. Unfortunately, Chinese astrology is so old that we just don’t have any ancient texts describing the process. Most likely it was done empirically, that is, astrologers looked at human behavior, came up with twelve types (to match their 12 year calendar cycle) and thought about which animal best exemplified each. Chinese animal stereotypes sometimes approximate Western, e.g., the loyal Dog. For the Chinese, however, Rat and Snake do not have the negative connotations characteristic of Western perceptions. In fact, they are two of the most prestigious signs. Already it can be seen there are both similarities (both have 12 basic signs) and differences (solar and lunar calendar) between Chinese and Western astrology. It is important to understand them to avoid confusion. Chinese astrologers base their calculations on the moon and its cycles, that is, on the lunar year. Western astrologers base theirs on the solar year. Thus, Western signs are called sun signs. In Western astrology the month sign, for example, Leo, is the primary influence, while in Chinese astrology it is the year sign. Chinese astrology also has month signs. Chinese months are not named (just numbered) and use the same names as year signs. 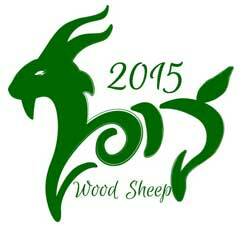 So, there is such a thing as a Wood Sheep year and a Wood Sheep month. Western signs are usually designated by one word, for example, Aquarius, and change from month to month. Chinese signs are designated by two Chinese characters and change from year to year. One character designates the year’s element and the other its animal sign, for example, Earth Tiger. The Chinese have used both decimal based calendars as in the West as well as a twelve year based calendar. The two are both used simultaneously by Chinese astrologers, thus resulting in the compound signs. If it’s starting to sound like Chinese astrology is complicated, that’s because it is. When you put together the 12 animal signs with the five elements, you get 60 total signs. Then you have to consider that each person has four of these. The practical effect of this is you could be in a high school graduating class of over 8,000 people, all born in the same year, yet no two having exactly the same “four pillars” chart. And, we haven’t even talked about star charts, which use additional factors. Each of us truly is an individual, as no two people on the planet born in the same year have the same Chinese star chart. There is one more very important thing to know about Chinese astrology. Chinese astrologers are not strict determinists. In other words they do not believe a person’s fate is sealed in stone at the moment of birth. What they do believe is that a person’s time and place of birth set parameters, boundaries within which a person has more or less freedom. What happens within these boundaries is influenced not only by “free will” but also by external factors such as financial status of the family, the culture, and the local economy. In one way this is just common sense, not unlike what people in the West already believe. If your adult height is five feet one inch, you’re not likely to be a professional basketball player. If your IQ is less than 100, you’re not likely to be a chemical engineer. There is of course a whole body of Chinese philosophy and culture underlying the precepts and findings of Chinese astrology. The subject of Chinese studies, as fascinating as it is however, is well beyond the scope of this basic introduction.One point worth mentioning, though, is that balance plays a central role in Chinese thought. Even this idea has Western counterparts, Aristotle’s “golden mean” for example. In Chinese thought a star athlete who flunks Algebra is still weak. True strength comes from balance. A strong chart will be balanced in terms of both signs and elements. Ideally a person will have, for example, a mix of strong and gentle signs as well as of elements. And, if a person has a variety of signs as opposed to, say, two Monkey and two Pig signs, so much the better. That means the person has a wider range of capabilities. Much of the above discussion has been about personality and abilities. 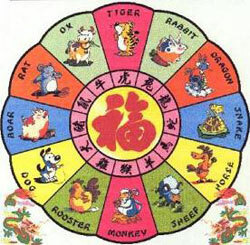 Originally, however, the primary purpose of Chinese astrology was fortune telling. The focus is usually on what will happen to people in various stages of their lives/a specific duration of time or on what people should do on a particular day or in a certain month or year.